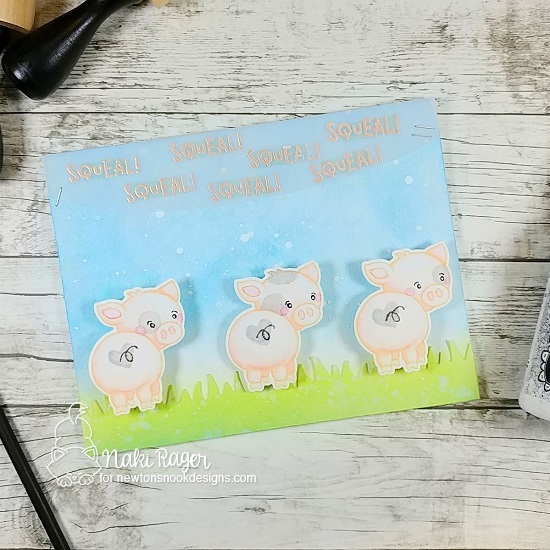 Newton's Nook Designs: April Reveals - Day 1 - Oink Stamp Set + New Dies and Stencil! April Reveals - Day 1 - Oink Stamp Set + New Dies and Stencil! Today is our first reveal day for our April Release! This month we have some adorable new critter sets that have a fun farm theme and some new dies and a stencil too! 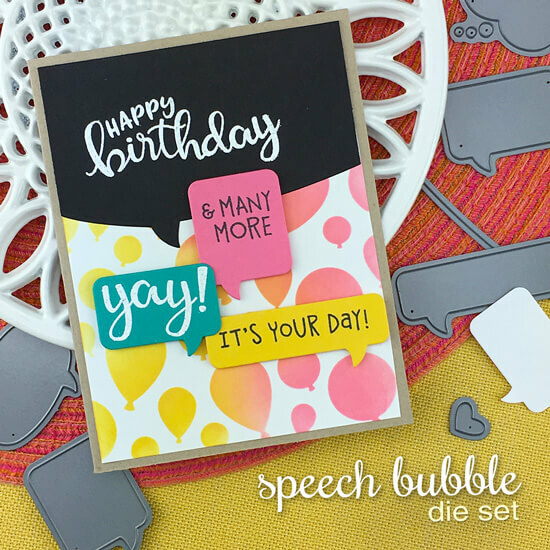 We're starting things out today with the new Oink Stamp Set, Fence Die Set and Speech Bubble Die Set. 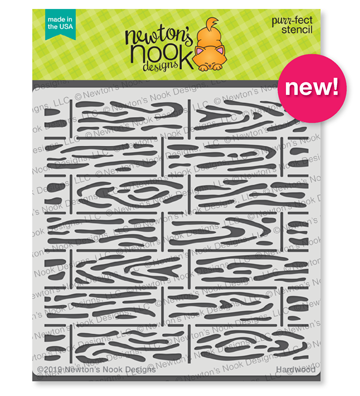 We're also sharing a fun new stencil called Hardwood! We are having a giveaway today too, so make sure you read all the way to the bottom of this post to see how to win! 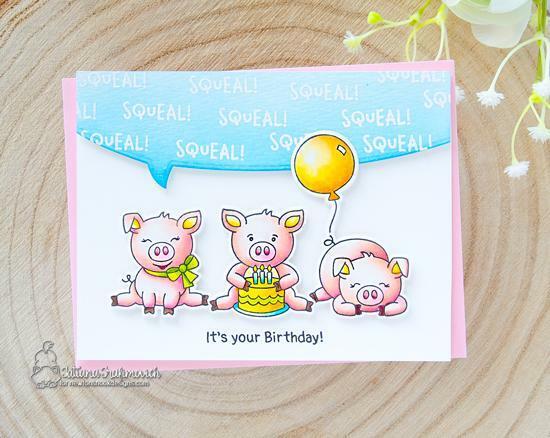 These cute little piggies are ready to ham it up on this 4x6 stamp set! 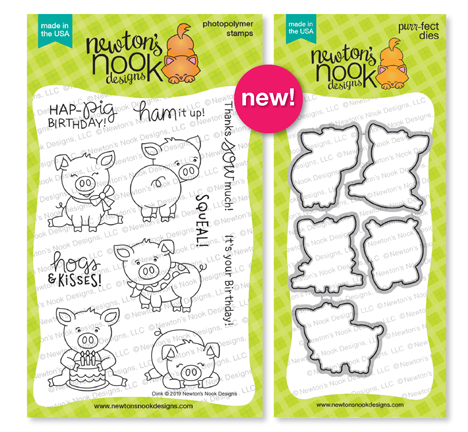 This set features five fun pigs ready to help you create adorable birthday cards and more! These piggy friends are so cute in their different poses and go perfectly with the pig themed sentiments! Use them to create farmyard scenes and more! Create fun spring and summer scenes by adding in a fun fence! 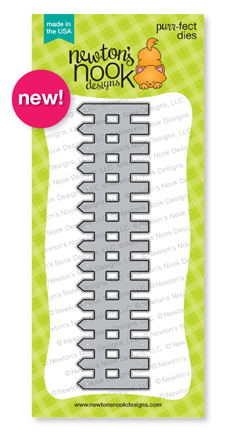 This fence is just the right size to fit across your card and goes perfectly with our stamps! Add it in the background for farmyard scenes and more! Try paring it with the grass or hill in our Land Borders Die Set too for added dimension. This speech bubble die will be so much fun to use with all our character stamps! This die set features 4 speech bubbles and one thought bubble that many of our sentiments will fit in. It also has a long border die that will fit across the whole card to really make a sentiment stand out! Try die cutting the little heart out of the larger bubbles for a fun effect too! Includes 7 dies: 1 border, 5 speech bubbles and 1 heart. Our Hardwood stencil is perfect for creating wood textures on your cards. Use it to create the effect of wood flooring or barn wood paneling to create a fun background for any scene. This stencil is perfect for achieving that rustic effect and works great with texture paste too! Get inspired with Farmyard fun by our Design Team! Squeal! It's an adorable Birthday card by Tatiana! 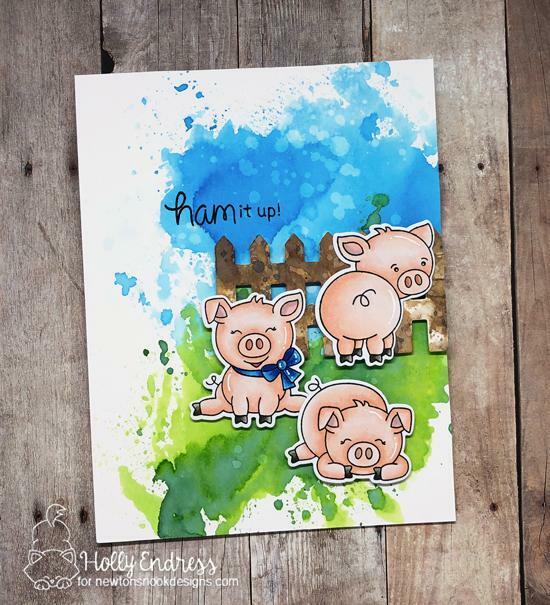 She created this card using the cute pigs from the new Oink Stamp Set. She added in a yellow balloon from the Fabulous Frenchies Stamp Set. She also added a big speech bubble across the top filled with the word "squeal" using the border die from the new Speech Bubbles Die Set. Holly created a fantastic trio of piggies ready to "ham it up!" She used three of the pigs from our new Oink Stamp Set and colored them with copic markers. She added them to her card over a fun green and blue watercolored background. She also watercolored a bit of fence using the new Fence Die Set and layered that in to create a fun watercolor scene! 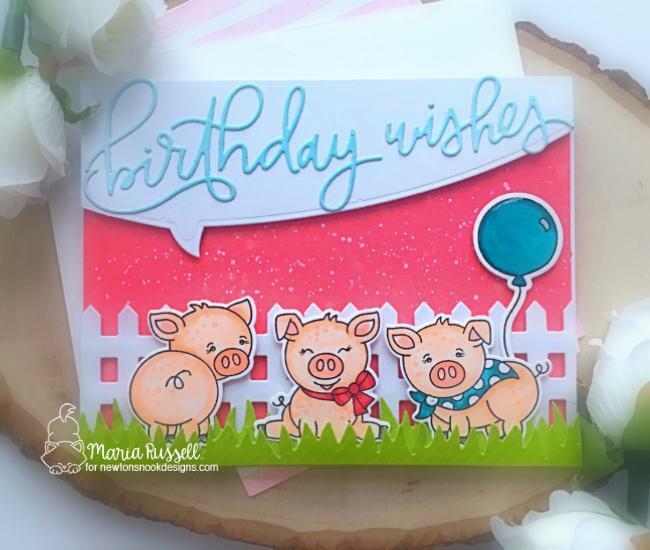 Maria created a trio of pig friends ready with birthday wishes! She used three of the pigs from our new Oink Stamp Set and colored them with copics. She added in a balloon using our Fabulous Frenchies Stamp Set. She also used the new Fence Die Set and along with our Land Borders Die Set to create a fun scene. 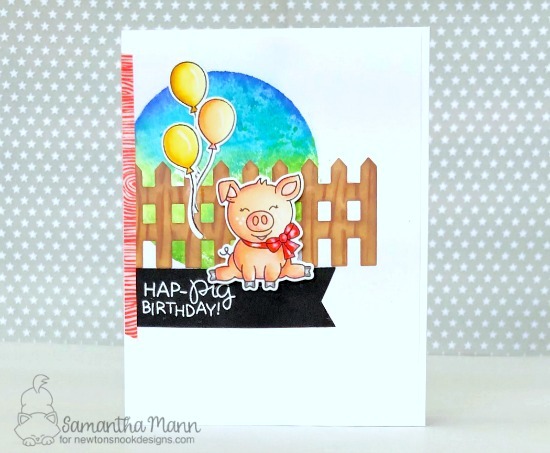 Samantha created this card for a "Hap-pig Birthday!" She used the cute pig from our new Oink Stamp Set. 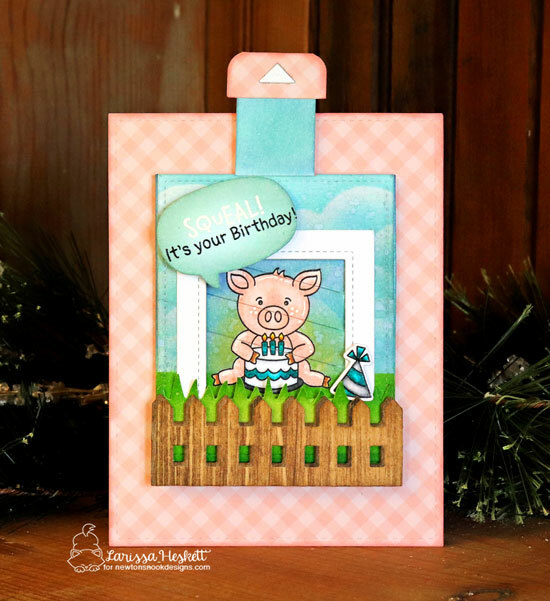 She added the pig to her card along with a cute fence using our new Fence Die Set and added a woodgrain texture to it using the new Hardwood Stencil. She also added in three cute yellow balloons using our Playful Pandas Stamp Set and Die set. Squeal! This card by Naki will make you smile! She used the new Oink Stamp Set to create this adorable trio of piggies showing us their backsides! It's so cute how she colored a heart onto each of their butts! In the sky she cut out a speech bubble border from vellum using the new Speech Bubble Die Set and filled it with the word "squeal" She also used our Land Borders Die Set to add layers of grass along the bottom. 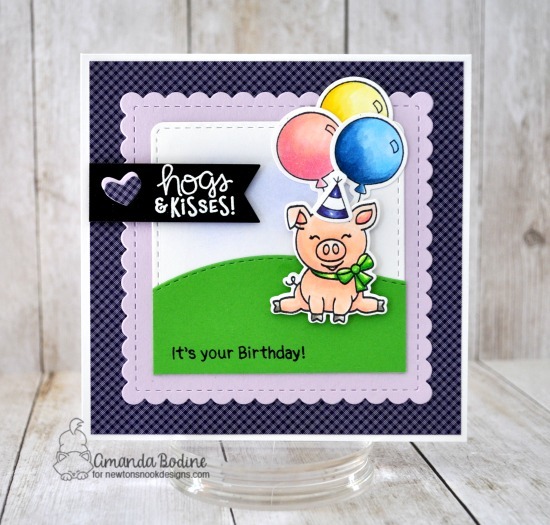 Amanda created a sweet little square birthday card featuring the pig from our new Oink Stamp Set. She added the cute pig to her scene along with balloons that were added using our Fabulous Frenchies Stamp Set and Die Set. She used our Land Borders Die Set for the cute little hill. She also used the Frames Squared Die Set for the Scalloped Square and the Frames & Flags Die Set for the banner that holds the sentiment! So cute! 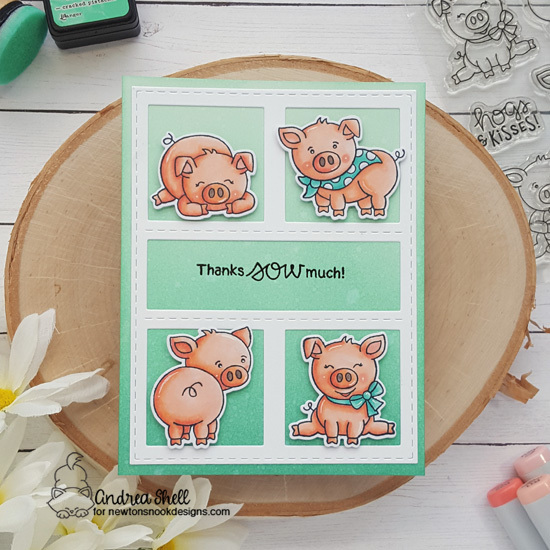 Andrea created a cute pig Thank You card with our new Oink Stamp Set. She colored four of the cute piggies using copic markers and added them to her card using the coordinating Oink Die Set. She layered them over a yummy mint green background with the sentiment in the center! So adorable! 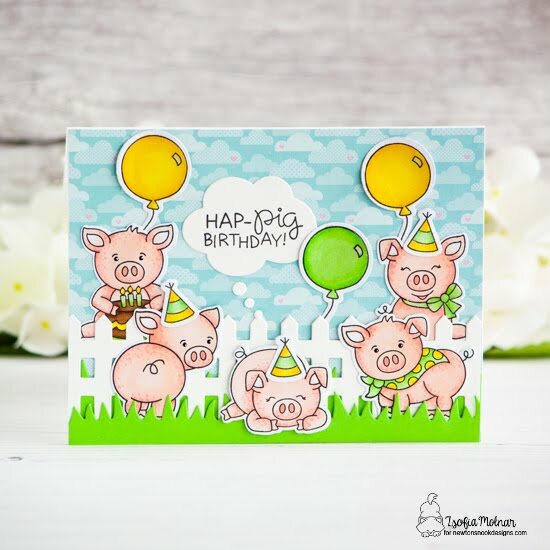 Get ready for a whole party of pigs on this birthday card by Zsofia! She squeezed all five pigs from the new Oink Stamp Set into a fun party scene. She added in birthday hats and balloons using our Fabulous Frenchies Stamp Set and Die Set. She added the sentiment into the middle using the thought bubble die cut from our new Speech Bubbles Die Set. She also added in a fence using the new Fence Die Set and grass using our Land Borders Die Set. What a fun piggy party! Would you like to win the “Oink” Stamp Set? Comment on the NND blog and Design Team blogs (see list below)! The winner will be chosen at random from the collective reveal posts. Make sure to check out each of their blogs and comment for your chance to win. You will not know which blog has been chosen so the more you comment on the better your chances are of winning! You have until Thursday April 11th at 9pm EST to comment -- winners will be announced on the blog post on Friday, April 12th. . Simply darling! loving the fence and those cute piggies! Squeal!!! What a fabulous and fun new products and stunning inspirational projects from NND and Design Team!!! Love the cute sentiments and adorable images!!! These little piggies are so cute and love the new dies and stencil also!!!! Great job! Adorable cards. Love those cute piggies. Loving these new products! Sweet pigs stamps, fence and speech bubbles dies, and that great hardwood stencil. These piggies absolutely have to come to my home, I love them!! Great inspiration from the design team! I must say, the PIGS are my FAVORITE!!!!! I just love them. I can imagine so many different cards using them, especially this year since it's year of the pig! I am a pig collector and these are adorable! So many awesome cards. Thank you! Love these cute little piggies! The entire release is great, but those little piggies are too adorable! these are so very cute stamps with piggies! Thank you for sharing these amazing creation! Those pigs are too darn cute!! I love the bubble die set too! I absolutely LOVE ❤️ the piggies, and would find many uses for them on cards, scrapping pages of the farm, and off the page fun ideas. Such fun new items! Love the fence and speech bubble dies, oink set and stencil design! These piglets are just so cute! Can't wait to get my hands on these new products! So many new must have in this first sneak peek day! Omg I love all the cards!! could be so cute and lovable. clever. Lots of great cards. This stamp set is so adorable and your DT has done an amazing job! What fun "piggies"! I enjoyed seeing all the creative cards done by the design team. What amazing reveal, the piggies are so cute! I also the hardwood stencil and the fence ans speech bubble die! I’m building my stamp collection and would love to add these stamps to it! I can't wait to get these piggies! I need them to make some cards for The American Mini Pig Association! I have a sweet pet pig and her name is CaBella!